Parents look on as the students pose with Swami Aksharananda and others after receiving the monetary assistance. 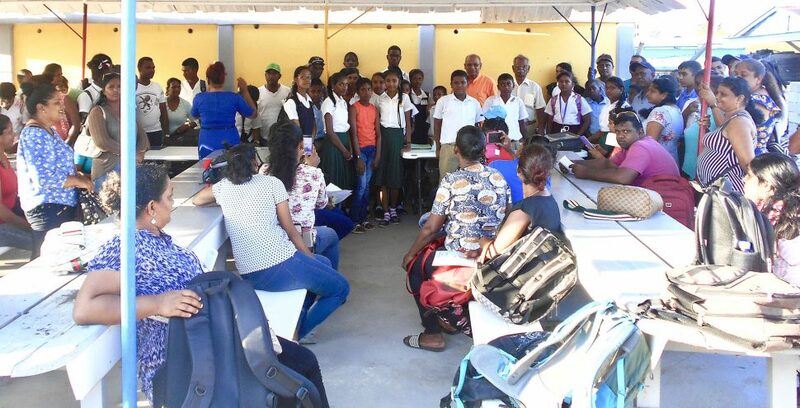 As former sugar workers in Berbice continue to face financial struggles following the closure of two estates for almost one year, the Saraswati Vidya Niketan (SVN) provided 75 of their children with $10,000 each towards their education. Principal of the school, Swami Aksharananda, along with some sixth form students traveled to Berbice last Wednesday to make the presentation at an event held at Sukhpaul’s Gas Station at Corriverton. The principal said that with the help of community workers and teachers, some 100 students have already been identified to receive assistance. The students, mainly from Line Path Secondary, Lutheran High School, Tagore Secondary and Canje Secondary at Rose Hall, Canje qualified for the assistance after filling application forms and providing student verification. According to the principal, SVN saw the need to step in and take action since the workers have not yet received the full severance benefits that they were promised. “Whatever the politics or economics of the situation, the fact is that the communities [that are] directly dependent on the estates are hurting,” he said. Swami Aksharananda said: “Funding for the project so far has been provided by SVN itself and its students. The SVN “wishes to thank Pandit Rangaswami from #73 Village Corentyne, well-known community activist and leader, Mr. Hari Behari, and Mr. Surin Sukhpal for their assistance,” he said.